ROTTERDAM, Netherlands, March 18, 2019 /PRNewswire/ — Moerdijk is one of the largest petrochemical production sites in Europe, and Moerdijk Solar Park is one of the largest solar parks in the Netherlands. The modules in the park were installed by one of the leading solar EPC contractors Biosar Energy (UK) Limited, member of AKTOR Group. With over 12 years of successful cooperation with Suntech, Biosar has engineered, procured, constructed and operated GW’s of PV power plants, including some of the industry’s benchmarks, such as the one in Moerdijk. Moerdijk Solar Park has been designed with 76,000 high efficiency, monocrystalline, half-cell solar modules delivered by Suntech. Suntech’s leading technology solar modules arrived at the Port of Rotterdam last September and are now generating approximately 27 megawatts of peak capacity for Shell’s Moerdijk Solar Park, equivalent to the energy consumption by 9,000 Dutch households. 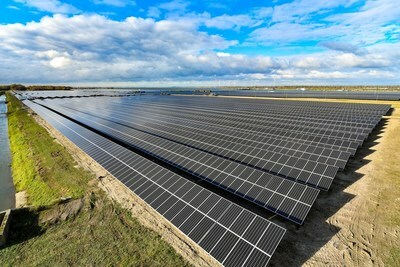 It is reported that all the solar modules in the Solar Park have performed excellently in circuit optimization and internal loss reduction, which is attributed to the constant pursuit of excellent quality by the company that demands all manufactured modules must undergo multiple strict tests to ensure the on-site steady and safe performance. As a leading brand in renewable energy, Suntech was chosen by Shell (SNE) and Biosar Enery (UK) Limited, both industry leaders in their fields. Guided by the “customer-centric” management philosophy, Suntech has adopted the refined management to better serve its customers. While responding quickly to customers’ requirements on the manufacturing side with rapid implementation of measures, Suntech is well known for its customer service and reliability. With its main focus on customer satisfaction, Suntech has established a bridge of communication between the customers and the company, setting up customer service centers across the world to bring them closer together. A new symphony in Suntech’s commercial line, Solar Civilization, an energy transition that shifts its focus to a sustainable living environment, is proven by cooperations, such as the one in Shell’s Moerdijk’s PV power plant. From its leading position in the global energy industry, Shell actively promotes the energy transformation and sets examples on how traditional energy companies could promote solar energy to tackle the issue of carbon dioxide in industrial production.